As of this writing, there were only 10 customer reviews left on Amazon by customers who bought this lawn mower and 2 answered questions. This is a very low number of reviews for an item. I've read the feedback left by customers in detail and also looked at the lawn mower specifics. The results are condensed here in this report. I hope that this makes your lawn mower shopping experience more efficient. The Kobalt 13 Amp Electric Lawn Mower has a 21 inch deck. This means that it has a 19.5 inch cutting area, or path that it will make as your cut your grass through your lawn. The purchase of this lawn mower comes with a 5 year manufacturer's warranty. It has adjustable height levels for the height that you'd like to leave your grass after the cutting. This lawn mower starts with an electric start with safety. It is a corded electric lawn mower as the name suggests. Your neighbors may just thank you for buying the Kobalt 13 Amp Electric Lawn Mower. It runs much quieter than a gas powered lawn mower. People who bought this lawn mower commented favorably on how quiet it ran. This is a great feature because it gives you more options for when you can cut your grass if you don't want to disturb neighbors. With this lawn mower, early morning and late evening mowing is a possibility with no worry of disturbing neighbors. This lawn mower simply is not going to be as powerful as a gas powered lawn mower. Some customers commented that the Kobalt 13 Amp Electric Lawn Mower had problems cutting through damp and tall grass. This is what is to be expected though of an electric lawn mower, not necessarily a flaw of this specific lawn mower. It will not perform as powerfully as a gas lawn mower. When cutting a lawn, every inch longer your deck will be, will save you work and time needed to cut your lawn. 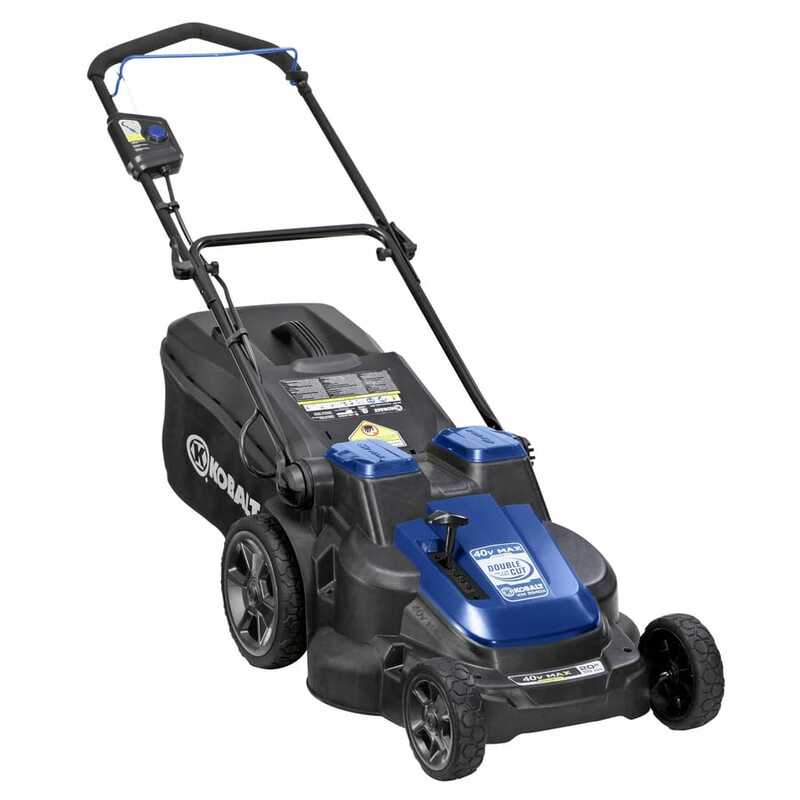 The Kobalt 13 Amp Electric Lawn Mower has a 21 inch deck which is considered large. Some of the electric lawn mowers I've reviewed only had a 14 inch deck. A 21 inch deck on this lawn mower means you will get a 19.5 inch cutting area, which is great. One of the great things about electric lawn mowers like this Kobalt 13 Amp Electric Lawn Mower is that it is almost maintenance free. There is no need to winterize it because there is no fuel in it. Without fumes, you also won't have to clean parts, nor change the oil. Even when cutting your grass, as long as your electric is on, you don't have to stop to fill up the tank with gasoline. This is a great advantage to electric lawn mowers like this one. If you've never used an electric lawn mower, the cord might take some getting used to. One customer who said he really wanted to like this lawn mower, couldn't get used to dragging a cord around. This is one of the downsides of electric lawn mowers. Some people suggested to get a routine going if you will be cutting the same lawn each time. Once you get in the swing of how you will avoid and move the cord around, and then follow that plan each time, it really isn't that bad in my opinion. I've owned both a corded and gas powered lawn mower. The corded type will just take some getting used to. One of the great things about this electric lawn mower is how fast is starts up. If you have ever owned a gas powered lawn mower, you may experienced times of it taking a while to start up. A quick and painless start up is one of the beauties of electric lawn mowers like the Kobalt 13 Amp Electric Lawn Mower. Some people bought this lawn mower just for the convenience of an easy start. One customer explains, "The motivation was that the old one gas-powered does not want to start. This one starts in 1 sec after a push of a button and pull of a handle." The Kobalt 13 Amp Electric Lawn Mower is a lightweight electric lawn mower that is easy to start. Just a simple push of a button and pull of a handle, and you are on your way. It is quiet compared to a gas powered lawn mower and it is practically maintenance free. However, this lawn mower will not be as powerful as a gas powered lawn mower and you will need to contend with dragging around a cord. The deck is wide at 21 inches so you will get a wide cutting area which means less passes to cut your lawn. If an electric lawn mower seems right for you, then I recommend buying the Kobalt 13 Amp Electric Lawn Mower. Here are some top questions that I found for people considering buying a Kobalt Electric Lawn Mower. Is this lawn mower lighter than a gas powered lawn motor? Yes, electric mowers like this one are in general much lighter than a gas powered motor. How much does this lawn mower weigh? The Kobalt 13 Amp Electric Lawn Mower weighs 34 pounds. Does this lawn mower come with any warranty? Yes, it comes with a 5 year manufacturer's warranty.